Do you reside in abroad and missing your favorite Gujarati food?? 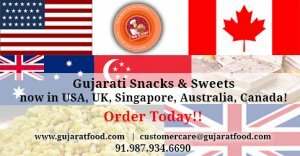 If yes, GujaratFood.com has come up with a unique concept for Gujarati Food Delivery especially for all the Indian food lovers residing abroad. Order your favorite snacks, sweets, masalas and Mouth-fresheners straight from the land of Gujarat and get it delivered at your place with just a click away.